World Health Organization says it will stop calling illness "swine flu"
MINNEAPOLIS, Minnesota (CNN) -- The disease most people in the United States and worldwide know as "swine flu" is actually a combination of human and animal strains and has not been shown to be transmissible through eating pork. Dean Folkers processes a pig for a customer at a grocery store in Elma, Iowa. And the nation's hog farmers and producers say the misnomer is hurting them. China and Russia banned imports from some U.S. states and Mexico, and stock prices for the nation's leading pork companies, Smithfield Foods Inc. and Tyson Foods Inc., took a hit. In addition, hog futures took a rare dive after initial news of the outbreak broke. In an already suffering market the negative news is something the industry says could have been prevented. "This flu is being called something that it isn't, and it's hurting our entire industry," said Dave Warner, communications director for the National Pork Producers Council. "It is not a 'swine' flu, and people need to stop calling it that ... they're ruining people's lives." Many government health agencies this week began referring to the strain by its official name: 2009 H1N1. But pork producers say the damage is already done. "The real issue is that anything is bad now because producers for the past 19 months have already lost money," Warner said. "On average they've lost about $20 a pig. So even if they lose $2 more, it's hard on them. Brian Buhr is a professor at the University of Minnesota whose emphasis is in livestock markets. He says that pork is a $1.8 billion industry annually in Minnesota. On Tuesday of this week, Buhr said, the state's pork industry took an $18 million hit. Minnesota is the nation's third-largest pig farming state, and its health experts said Wednesday they would be calling the illness "H1N1 novel flu" going forward.
" 'Swine flu' gives a connotation that really it shouldn't have, and makes people wonder about eating pork," said Minnesota Health Commissioner Dr. Sanne Magnan. The European Union has followed suit. "In order not to have a negative effect on our industry, especially under this crisis situation, we decided to call it 'novel flu' from now on," said Androulla Vassiliou, the European commissioner for health. WHO said this week that the disease "has not been shown to be transmissible to people through eating properly handled and prepared pork (pig meat) or other products derived from pigs." The Centers for Disease Control and Prevention confirmed to CNN that it would begin officially calling this particular influenza strain H1N1. However, the CDC's Web site is still largely "swine"-centered, and the media continue to discuss "swine flu" -- much to the dismay of the hog industry. "There's a large concern over the name [from the hog farmers' perspective]," said David Preisler, executive director of the Minnesota Pork Producers' Association. "They just wanted it to be accurate." H1N1 is a more appropriate label for this flu, because a direct link from pig to human has not been established, according to Professor Marie Gramer's who studies swine disease at the University of Minnesota. "Swine flu" was "an unfortunate name for everybody involved in swine production, implying that the pigs were the source of this current outbreak," Gramer said. The CDC describes swine flu as a contagious respiratory disease that affects pigs. It is caused by a type-A influenza virus. Outbreaks in pigs occur year-round. The current strain is a new variation of an H1N1 virus, which is a mix of human and animal versions. Peter Davies, professor of epidemiology and swine medicine at the University of Minnesota, said the name "swine flu" is potentially misleading. 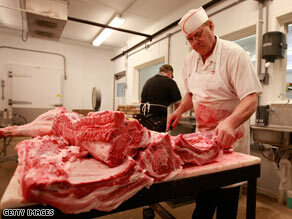 "We've seen a huge drop in the price of pork," Davies said. "We've seen a lot of interruptions to commerce." Though the name has officially changed from "swine flu," it may be too little, too late for the industry, said Davies. "I think it'll take quite a while, if at all, before it trickles into the media or in the general public's conversation."